I recently won an audition for a well-known Bach cantata series. For part of the audition, I was asked to read music with a few singers in an ensemble setting. The conductor knew I could sing an aria, but wished to know more about how I collaborated with other singers and instrumentalists. Did I, in other words, play well with others? This past season, I was a featured soloist and ensemble member in a local Bach Festival, and all of this has had me thinking about the notion of a being a soloist versus a choral singer. So often I hear young singers-in-training complain about ensemble and choral singing, boldly stating that they are only interested in solo opportunities. I must admit that I held very similar opinions. Studying to be a solo singer (which can be much more lucrative a career than being a chorister) requires confidence commensurate with the risk you are taking. It is a bold statement to say that you are worthy to stand in front of an orchestra and offer your take on an aria, and I understand that a young singer might want to define themself as only a soloist to help justify that risky choice. In looking back, however, I feel as though I’d missed the point. There is a contingent of voice teachers at most conservatories who warn against the evils of choral singing, and the dreaded straight tone in particular. Many undergraduate performance programs are filled with such teachers, who find themselves constantly at odds with the choral department. At fault as well are young singers, who have been conditioned to think that their value lies in having a voice that is too big or too unique to healthfully withstand the constraints of ensemble singing. Yet, I believe that there is more at play here than simple ego, as many young singers truly do not know how to sing healthfully in a choral setting. At the risk of preaching to the choir (pun intended), I especially caution young countertenors to avoid thinking that they are above ensemble singing. Not only because the skills you acquire singing as a chamber musician will serve you when you sing as a soloist, but also because it is more and more common for orchestras to expect you to do double duty. Due in large part to the interest in historically informed performances of the music of J.S. Bach (among others), the practice of soloists singing with the vocal ensemble has become quite prevalent. Whether it is for scholarly or economic reasons, this trend is catching on, spreading from the small world of Early Music specialists to mainstream and modern ensembles. 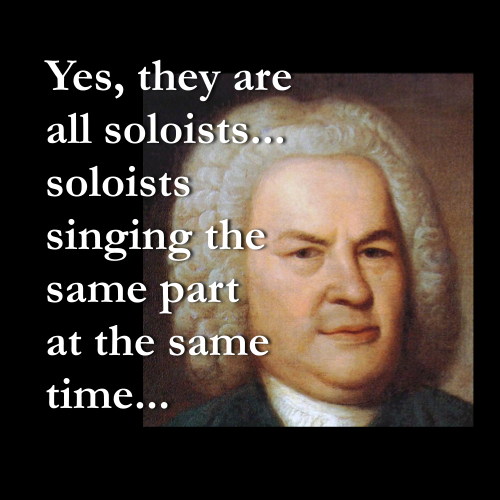 Despite the long-standing debate among scholars as to the size of Bach’s ensembles, it is generally agreed that concertists (vocal soloists) would have sung the choral parts (with the ensemble-only ripienists). In his article, “Bach’s Chorus: A ‘Brief Yet Highly Necessary’ Reappraisal,” Andrew Parrott suggests that this was common practice in German and Italian choirs from the time of Praetorius well into the 18th century. Although the practice of soloists in concerts and operas serving double-duty seems to have fallen into disuse through much of the 19th and early 20th centuries, it is important to remember that Bach’s music was written for the church and not the stage. In a sense, the tradition was never lost, as church choirs have continuously employed section leaders to bolster their performing forces and sing the solo passages. In recent years, there has been a desire to produce authentic performances of music spanning multiple centuries. Although the value (and accuracy) of such authenticity is debated (Rilling’s Oregon Bach Festival Orchestra has played on modern instruments for the past three decades, for example), at its core, historically informed performance practice seeks to present music in a close approximation of the original circumstances. The thinking being that a performance that sounds as Bach would have heard it best contextualizes the compositional choices that he made. So what does this mean for performers, and how do scholarly advances in historically informed performance practice affect the way in which we approach our own singing? One thing we can glean from such scholarship is the sense that J.S. Bach and his contemporaries did not necessarily see such a wide gap between solo and ensemble singers. In recent decades, the American ideal for a baroque music singer has gone through many mutations. At the start of the early music revival, singers prided themselves on a leaner, more European sound. Simply put, they sang with less vibrato, and were generally quieter than their opera singing colleagues (think early Dame Emma Kirkby). In more recent years, we have seen the acceptance of a more full-throated approach to singing baroque music, and what you will come across depends as much upon the personal taste of the conductor as anything. If you work for someone who asks you for a straight tone (typically more common among organists and choir directors as compared to orchestra conductors), whether you agree with the aesthetic or not, you are going to have to figure out how to give them what they want. Generally, when a conductor dislikes vibrato, what they really dislike is bad or wobbly vibrato. I have found that the fastest way to make a healthy (and healthy sounding) vibrato-less (yet vibrant) sound is to simply sing quieter, as natural vibrato can be said to increase in intensity in proportion to amplitude – if you have been practicing your messa di voce exercises, this should be no problem. In other words, the muscular quivering that causes a healthy vibrato is the body’s way of dealing with the increased stress placed on the vocal folds when singing loudly. While it is, of course, possible to sing with healthy vibrato at low volumes (and often quite aesthetically beautiful), it is not always necessary. Keep the rest of your technique the same, just sing with a quieter tone. As is the case with singing in any context, the onset of tone is perhaps the most important element. The ease of onset will indeed determine the ease with which you sing a phrase. It is important that the vocal folds come together gently – this is to say that there should not be an excessive expelling of breath preceding the tone, nor should there be excessive pressure built up beneath the adducted vocal folds. A pressed, flattened, or held tone is not only unpleasant, but can also be harmful to the vocal tract. Conversely, a free and easy “straight tone” maintains a shimmering quality and allows the folds to properly vibrate. How pleasant an experience this is for you will depend on a few things, notably the quality level and number of your colleagues. A one to a part ensemble will be freeing in a way that 3, 4, or more to a part is not, especially if you have a good set of ears and the kind of temperament that encourages you to ‘help’ your weaker colleagues. As we progress as aspiring solo singers, we hope to work with smaller and smaller groups of higher quality performers. I would argue that a healthy technique should not only include the physical facility to produce a clean yet spinning tone, but also the mental aptitude to be a good chamber musician. You must know your role in the overall sound at all times. Successful ensemble singing comes down to common sense. One must be vigilant to remain a collaborative part of the whole without contorting the voice in service of a uniform vocal sound. Perhaps more than anything, an open and eager approach to ensemble repertory will yield the best results. Understanding the harmonic function of each part is key, particularly in contrapuntal music. And when you think about it, all music-making is a collaborative process – whether it be with a pianist, a continuo section, an orchestra, or a choir. In this way, singing as a member of an ensemble will only serve to better inform your performance as a soloist.